I would get those bees tested for foulbrood. Look at the sunken cappings, perforated cappings, and the discoloured cappings in that last picture. oh ! well will see if still around when i get there. wouldnt know. didnt see any disease testing kits on sale anywhere. shaking into other hives i read if the case. says it is endemic in australia. seems common elsewhere. white gooy things in the pic here. says an otherwise healthy colony survives this. well I shall examine my hives in closer detail this year. assuming they have survived the winter lol ! thx for pointer ! useful ! i really need to learn about what is what in hives. as the song goes...i m an absolute beginner ! If the infected larvae are instead permitted to die, the house bees eject them from the hive and with them goes the source of infection. The bacterium does not form long-lived spores that persist on hive surfaces. The bacterial spores of AFB can last for 50 years and it is a notifiable disease leading to compulsory destruction of the colony in most European jurisdictions. AFB meanign american foul brood..well not knowing if it is foul brood or not let alone which nationality I dont know. and where is it ? see only european foul brood info just mentioned searching...cant find anyting about incidence of AFB except saying it smells. well the hives are registred. if they survived the winter will have a closer look in a few weeks time. dont know if this was my hive or farmers hive picture. there are hives all over the place. i was more into taking photos to try and learn about what was inside them than understanding what was there of course. so onwards to learn more soon ! i dont know how to see difference between worker queen or drone bees in my hives or those looked in yet ! or what the differnt things in the combs are ! it is all new to me. all i know is there were lots of bees around in the hives, honey more and less in different ones, and bee liquid food was bought to be given to them over the winter. now I read this AFB ws up to 50 percent of hives in uk some years ago ! and...the colony dies ultimately if it has it. eventually leading to death of the colony. so seems that if EFB the bees kick out the problem, if AFB the colony dies. helpful to inow. either way. not sure it is whatever if anything. didnt smell anything bad...melted combs due to extreme heat of last summer I saw on some combs...and bees had built comb oddly in places other than set frames. lots of new queen cells sticking out I saw also ! that bit i understood having read they stick out ! well not getting alarmist. i dont even know what species my bees etc are there ! that was what i was keen to find out...for sure diseases would be a prob like to any hives eeek ! but not about to think the worst not seeing the same thing as in pics of these foul brood things but then all these comb cells are new to me. is everywhere in USA and greatly in europe i see by list of countries ! seems a common prob therefore this thing but more in usa obviously probably due to its being named american foul brood hey. aha ! i love propolis ! and this report says effective for AMF ! so so ! another good reason to encourage propolis hey ! not use plastic hives ! interesting ! amazing to discover that natural defenses and natural ways are best ! from reading just after this post pointer i saw no manmade treatments were effective against etiher of these brood diseases ! long live natural bee keeping i say to that ! let the bees decide ! welsh black bee back from brink of extinction ! docile ! hardy winterers ! less food greedy ! now dont know if this is same as the cornish black bee but trying to understand WHY these native to uk black bees died out ...yes i want to know, if it was due to being weaker than the imported ones that bee keepers brought in so driven out by the more aggressive italian and carolinian bees i read...that is possible...like the grey squirel drove out the red one being bigger and more aggressive..
but ! the point is...seems to me...if so...black native bees ARE suited to uk climate, ARE DOCILE compared to other types of bees but ! will not be able to compete with nearby other types of bees...so ? survival of the fittest or strongest or most aggressive being the darwin theory seems they are at big risk even if fine as docile and good winterers ! which i end my point on...being now concerned to read all this feeding bees artificial winter syrups made them weak..jaja...my thoughts exactly...surely it is best for them to eat their own honey ! more natural ! but i cease providing the link to this fascinating to me black bee matter because i would so much like to have some black native bees ! especially reading how docile they are here ! ps now i was very annoyed my hives were ROBBED of their honey last autumn to replace it with special bee food syrup....due to the language probs I could not explain to the lady farmer who is looking after them for the winter there what and why i didnt want to take their honey ! I had an inkling that to get strong healthy colonies to get new colonies from once i found out how to do that of course in the coming months studying...i wanted simply to have a few years of not taking honey from my bees to let them eat that in winter. sigh. well not her fault she really couldnt understand what i wanted, and got alarmed when i cause a massive bee exodus one day when i opened a hive saying i wanted to COUNT THE FRAMES ! she was horrified ! said i was disturing the bees unnecessarily ! and i couldnt see her even in the thick clouds of irritated bees that flew out while i was trying to count and i couldnt the bars were stuck together so i gave up. aha ! the black uk bee was wiped out by a mite ! aha ! isle of white mite ! aha Acarapis woodi (acarine mite) s this thing didnt kill the other types of bees ! wonder if this mite is still around ? but maybe i think the more aggressive other types also drove out black ones. at any rate. black bees of uk are MORE DOCILE than the irrate italians ! ho ho ! just like with humans hey ? lol ! Bees do not get driven out. Subspecies get lost through hybridisation. 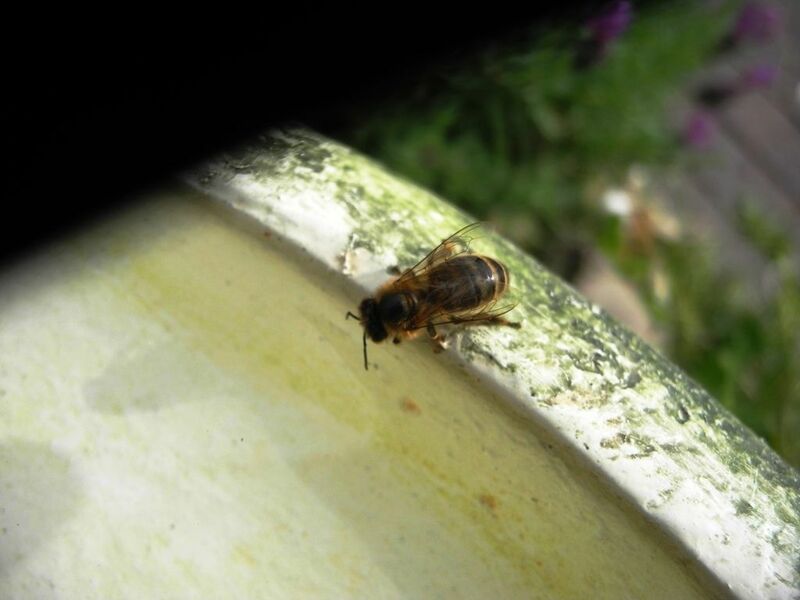 All the subspecies and Buckfast freely hybridise, although as mentioned earlier in the thread there is some evidence that Apis mellifera mellifera queens can selectively mate with drones from within its own race. aha so the threat to the black uk bee was and is principally the wood mite thing from isle of wight ! so so...no cure for that except then natural selection via the most resistant to survive it...guess that threat is still present...so by letting the bees select their mates naturally hope the breed will survive. i am bemused at the recent efforts to force matings by selections made by humans...i got huge laughs at the lt farm when i said i read even robotic bees had been deveopped to imitate the waggle dance lol ! they were amazed at that idea lol ! i said jaja all in line with efforts of humans to select reproduction of bees lol ! that is just my feelings on the matter, if these uk black bees are fragile it is a shame is my thinking. but some have survived hey so there is hope for them ! very interesting subject. very. and i did like reading these welsh blackies are docile ! so i thought suited to urban conditions where docility is a big advantage. must be pretty bees to see ! i like the colour black of course schh i have jet black dogs lol ! some think it a depressing colour and black dogs are the last to be adopted in refuges due to many not liking that colour but black bees ! they must be beautiful things to me. end of my thoughts ! until i spot some black bees for sale or feral hey ! fingers crossed ! ps after thought...ref your comment on only mating with own species of blackies...that is maybe what makes them weak...reduced gene pool..like the prob now in pedigree dogs...lack of genetic diversity means more incidences of specific diseases that are in the genes of a reduced pool of used mates...ja ja just as my belgians are 25 risk of epilepsy and stomach cancer due to their restricted gene pool the black bees may have low resitance to this wood mite disease in their genes...that other bees get over better. so that is the weakness of only mating in restricted gene pools generally in nature of course. but ! if they use survival of the fittest and find the mates not weak to this mite there is hope ! There are black bees that withstood the Isle of White's disease living in Stathes on the North Yorkshire Moors. I visited one of their apiaries a few years ago when I was a member of BKA Tees Bees. Allan Jefferson who will be about 81 has been in the business since he was 12. See the link to an old web page below. Allan said that he had his bees genetically tested and they were very close to the black bee and they did not get wiped out in the 1920's. They use Nationals and produce a lot of heather honey, I know that when any colonies show any sign of cross breeding they don’t use them for breeding. Allan told me he used to deliver his honey to a delicatessen here in Hartlepool. They are traditional beekeepers and it is their business so they sell any spare colonies. strewth ! no wonder difficult to find bees for sale hey methinks in uk ! if publicised too much they can get nicked eeek ! what has the world come to sigh. ps seems to me with people finding dogs stolen out of their backyards we now have bees stolen ! ouff best place for bees ? not in my backyard ! NIMBY ! but in the attic hey ! with no descending loft ladder preferably ! ppss i have a suspicion seeing several bees on my primrose hanging baskets and daffodiles today in the 11 celcius temperature that they are out ! and maybe close to my house due not only due to my flowers but the smell thru my open windows and doors of the used national hive i bought the other day full of used filled combs ! eeek ! i have not yet wire brushed and linseed waxed it yet ! hope they dont make a beeline into my lounge but hey this is encouraging ! seeing some bees around me here ! time to brush that hive up hey ! get a swarm in ! preferably not my lounge though hey ! You hear back from any Sicamm members re. their perception of the temperament of black bees? Not yet, since I had no time to lookup the email adresses of the vice president and other board members. I started seaching for the email addresses but could not instantly find them. Do wonder, why they don't have them on their own website. Gave up on it and forgot to redo. Sicamm is a virtual organisation with no income as far as I can see. It holds a conference every now and again. They did a joint conference with Bibba in Wales last September and I think Bibba got the funding for most of their conference speakers. i have some news re temparament of welsh black bees as of yesterday at flintshire bee keepers meeting, one of their members has some up far in the hills and those having met them said VERY DOCILE ! I don't mean to be rude but if you continue to handle bees like you are in the video, you are going to end up with an extremely defensive colony that will be a risk to you and your neighbours. I felt physically sick watching you clashing those frames about and you can hear that the bees are very unhappy about it. Please find a mentor or join a local association and learn how to handle bees quietly and gently. Once that colony becomes bigger and stronger you could have a serious problem on your hands if you don't learn to handle them properly. Always ease each part of the hive with your hive tool and examine each part for the queen before you put it down.....For instance, the first thing you see is the removal of the crown board. It comes off with a bang and the bees hiss and are immediately agitated and then you just put it to one side without checking the underside. If you had gently prised it up with the hive tool in each corner in turn, it would not have jolted as you lifted it and the bees would hardly have noticed. Check the underside of the crown board for the queen before you put it down. It is unlikely she will be there but if she is, you risk losing her, so it is always safest to do so. When you lift the frames, again, gently ease up each end of the first frame by a few mm with your hive tool to loosen the propolis and lift it out with two hands so that the frame remains in line with the hive, otherwise you will squash bees between the frame and the hive wall. You could easily kill the queen like that. Keep them over the hive so that if the queen drops off you don't lose her. If she falls to the ground, she will not manage to get back into the hive because she cannot fly. The next frame should be gently prised along into the gap created by the first frame and then lifted and examined for the queen again before being transferred to the new hive and so on. By all means talk to them, I think that is good practice but work slowly and gently. I hope that you have not left that hive with two stories and just those 5 or 6 frames of bees in it. They need a smaller volume to occupy initially, so just the one brood box is sufficient for now. I think the manner of placing those frames in it across ways will cause you problems in the future too and you would be better getting rid of that Dadant and getting a national hive pronto. I appreciate that you may have handled these frames one handed so that you could take video whilst you worked, but by doing so you have done your bees and your reputation no good. Please learn to walk before you run for the sake of your bees and as well as yourself and possibly your community too. Angry bees do not make good neighbours and can be a very serious problem. I know you are enthusiastic to be a beekeeper and help bees, because I have read all your other posts, so I hope you will take my comments on board, as they are intended for the welfare of the bees and yourself. If you lived closer I would be more than happy to help you learn because I do think you need practical guidance. I hope there is someone nearby who can do that. As a novice beekeeper, I have found it very helpful to use a little smoke or sugar water spay to calm the bees. This was taught to me by a beekeeper of 40 years experience. Even the best behaved hive can have an off day and will "light you up " for no apparent reason. It is also best to work with your hive when the weather is sunny, the worker bees are all out looking for nectar or pollen, usually around mid-day. I would advise joining a local association for some good practical training or find an experienced beekeeper who can teach the basics well. I try to observe my hives for a few minutes before any inspection or manipulation, to try and minimize any undue upset to them. thank you for these comments, very useful. and i was clumsy with the board and frames. bad show yes. it was a very hot day and not the right time to do this move but i did it...i have in fact removed all those plastic spacers with fitted wood spacers better for heat insulation and not gaps that would make propolise work too much there. I have joined an association ! flintshire one ! and am attending my 3rd attendance soon on snelgrove expansion ! here is i think much better fitted frames that mean the bees will be warmer and more snug. it was not easy to transfer a nuc on national frames into a dadant hive where frames are larger...but now the frames are as snug as possible. oh just one relevant comment and view ref temparament of the black bees, i got stung by one on collection of the nuc up my nostril...and then a few stings on the wrists another time...and in both cases the stings were EXTREMELY MILD ! 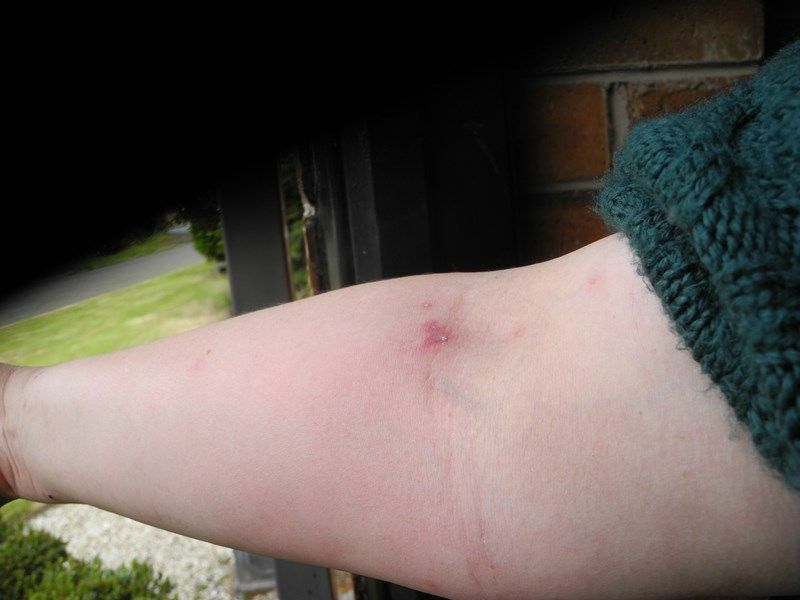 i was surprised, it felt like a mosquito bite on impact, then hardly itched at all, and no swellings appeared at all ! This I have to say is a big contrast to stings I have received off other bees. 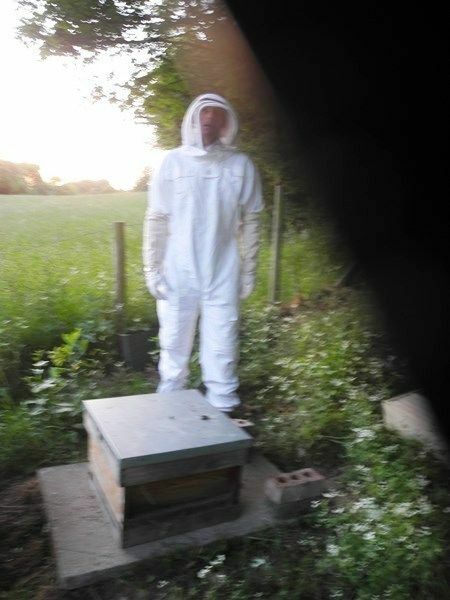 On placing the 2nd nuc hive on site and opening it at once to let the bees fly after hours of being shut in, I was able to approach and place a water feeder right next to their hive without a single attack or mass of them...i was not wearing my suit on this occasion so would have felt anything. I do feel they like all creatures have MOODS and are affected by the WEATHER greatly for agitation...so it is i think very difficult to GENERALISE about the mood of a colony based on single incidents, it has to be based on many times in many circumstances visits assessment. That said, a colony with a nasty queen making them nasty I found was in other bees dealt with other than these new blackies VERY aggressive on all occasions I dealt with them. 2ND TRANSFER ACHIEVED OF BLACKIES ! A FULL COLONY THIS TIME ! and I was gentler ! much better ! TAIP ! yes we all admire Wales ! and just in from the biggest test of nerves of transfering a COLONY of Black bees into a Dadant LT hive ! here is the SIR IAN Farmer of Flintshire who dared to face the tens of thousands defending their home being attacked by us this evening !bees do not waste their energies on stings unless they have to, they die so kamikaze is only when really under attack ! at once point we lost our nerve and said...shall we put the lid back on and leave it for now ! then we rallied ! and decided to finish the job ! no pictures during the attack of course I was covered in bees ! oh and...i forgot to put enough under clothing under the suit, had bare arms...and...i forgot my suit trousers...and...i drove over the hive stand with my car by mistake crushing it...and i forgot the metal lever to separate the frames...and the smoker to calm the bees...well as Goethe wrote in Fastus, ES IRRT DER MENSCH SOLANGE ER STREBT ! we make mistakes when we strive ! in the stress and excitement of things in our livfes we often think we are prepared but have forgotten in critical moments the critical essential items ! or the mobile battery fails us the only time we have a tyre puncture ! life is like that ! we just have to deal with it as best we can ! and not say like British Rail...it is the wrong kind of snow ! get a shovel out if so ! We stopped in shock at the sight ... but I carried on...thinking do it now it will be over soon they can settle again...once the lid is off they are mighty annoyed and will attack in greater strength if we leave it to another time...do it now...gently does it...one by one...put the frames in the hive....just shut the lid and walk away slowley leaving all stuff where it is ...deal with final adjustements tomorrow not now...hold your nerve...hold your nerve...this has to be done, do it now...quietly gently but surely ...ouff i kept saying good job i am not videoing this ! imagine the horror comments i would get on the bee forums to show this horror movie ! Then I had a vodka and orange. to celebrate. ouff ! it is done. the lesson is wear thick underclothes, the bees got through the suit in the folds, wrists, elbows and knee areas...the weak spots...any folds in clothes they aim for...and of course i had not fitted my gloves properly...oh well my usual inadequacies...but we got there ! it was sure good to have moral and physical support at hand for this one ! Groenendaels Cymru Wales in fields July 4th Independance Day for USA and all animals everywhere hoped also free enjoying the right to Life, Liberty and the pursuit of Happiness. Tourists, walkers passing seemed happy too. 1.how long for bees to be born and productive ? i said days only, a week about. queen lays 1000 eggs per day i said, in fact it is 1500 i have read that makes a full colony of 50 thousand bees from scratch, eggs in ? days...2 weeks about guessing. 10 days she would lay 15 thousand eggs, a big colony is up to 60 thousand so in 1 month the queen could have laid enough eggs for a full colony. taking now beginning of july that means by end of July a new queen could have created a full strength colony, and uk summers last into ouff even october nowadays for temperature and flowers even. unlike LT where temperatures drop like a stone during august and leaves turn golden in september even, come october the winds from the east blow strong and bring the rain too and then the freezes. So about 2 months to have the worker bees out there collecting honey etc. From egg conception laying to productive. 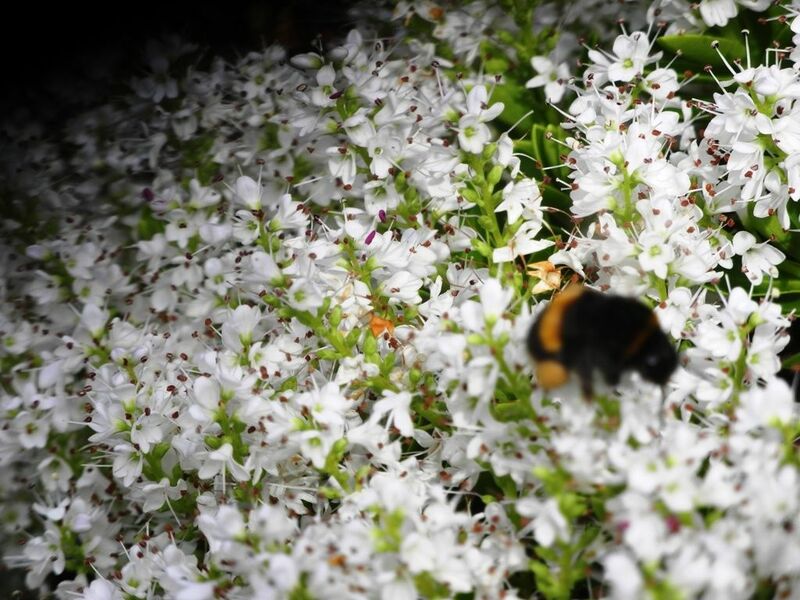 2. yes the bees decide when to kill the queen, often when she isnt laying enough eggs to produce enough workers to produce enough stores of honey etc for winter. she can live up to 5 years most other bees only a few weeks except a few thousand for the winter period waiting for the next spring. 3. nature is cruel to kill each other like that ? well i dont think so it is quick and fast not torture...i call cruelty tortore not death itself. it has to happen for the colony to survive. 4. yes amazingly CLEVER bees to decide things like that and all the task allocation they have...the first jobs are feeding other eggs, then cleaning the hive, then guarding the hive then finally going out to find food and bring it back. 5. i don't understand how a queen avoids inbreeding still. i have asked the question but not got replies to this issue. like most animals bees in particular it is normal to go further afield to find a mate ...wolf packs split up the young uns go their own way once adults and so inbreeding when they were numerous is avoided instinctively. A queen bee selects only 20 male drones to mate with i read, very selective...so of 2000 drones say very very few are chosen for the dance and death that follows. The rest are driven out by the female infertile worker bees. 6. darn it...just saw neighbour who works for some recycling company who was going to take me in secret to see the state of the art WILD BEE unit at one of their works...next sunday we agreed...he has just been poached by another company and current company wants him to stay on as consultant...he is from Devon, rents place here, has place in fields overlooking the sea there and goes once per month sometimes by plane...said okehamption have hive builders when i told him of sheissable national hive leaks here the other day...i said the thing leaked ! one slight shove and out they come ! even allergic to wasps woman however told her husband when he ran to her saying loadsa wasps around carpark said Oh no those are BEES...unconcerned...yes well she does better than me hey to know a wasp from a bee ! it is a quincy olde worlde type plum tree she cut too many branches off to prevent wasps in those overhanging her garden she said to me...did I want the branches ? i said i dont have a wood chip mulcher and no i am not building birds nests out of those brances too thin so ok for the skip to take them away. i need that ground for my flower beds ! ok nettles are not flowers but all the same those carpark plant areas are ALL mine to mess with since years. now you see this article does not say clearly either how the queen selects her 20 i have read elsewhere mates. oh madame allergic to wasps told me she saw programme where USA were using SMELL POTIONS to get queens to mate as they wanted...that lot manage to complexify everything hey i thought again...interfering with nature...could be VAROA succeptible queens they are selecting hey ! and just look at the state of selection by humans in the pedigree dog world ! a catastrophy ! they all have their special diseases per breed now due to inbreeding ! NEXT sunday i go visit the state of the art WILD BEES COLONIES at this recycling plant. he said NO PHOTOS ! it is secret ! well ouff that will be harder than staying off cigaretes soon ! i am addicted to photos ! the blackies are very mild...evidence ? no swellings this morning from where they got me yesterday badly kitted in my summer dress with no sleeves on under the yes very good quality suit...the hat was great, not a sting on neck or face on in the folds of the clothing badly fitted. 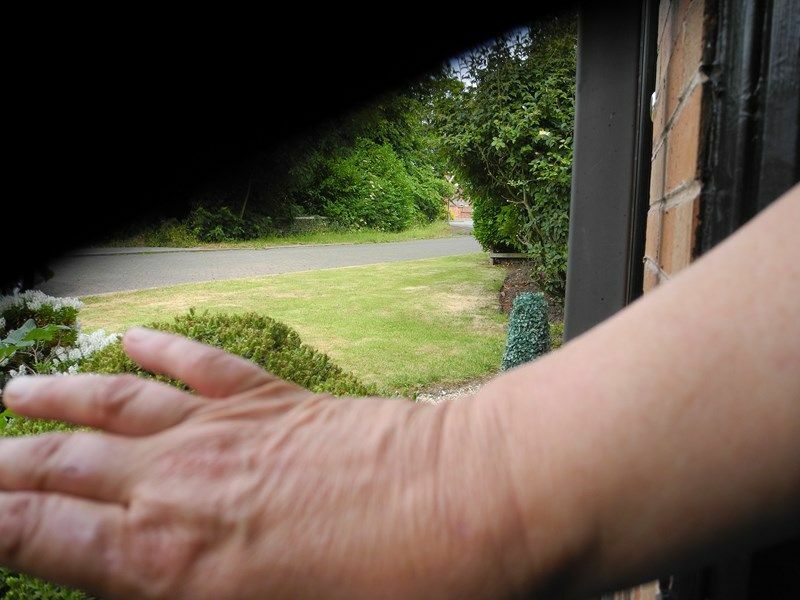 what i want to look at through the GLASS OBSERVATION frontage is how the bees are working ! moving around...their colours and shapes and other things like that close up. are you putting more hives out in the fields ? he asked me...strewth ! as aussies would say ! there ARE no more black bee colonies around to do that yet ! i have to CREATE them ! or rather the bees have to ! it is BLACKIES RULE for Wales intention ! 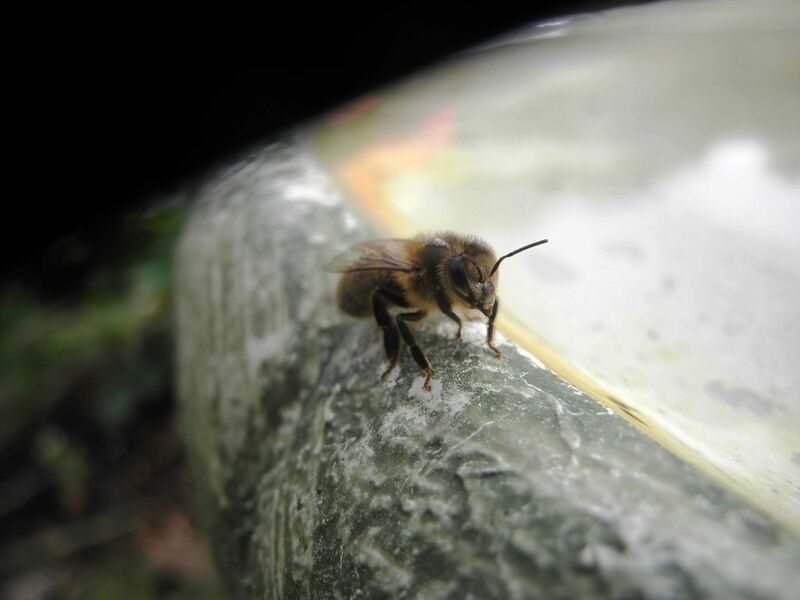 those Palace Hives are dedicated to the Hills of Wales ! not backyard gardens...those need TOP BAR HIVES to be built by me and that adopted son of farmers out in LT ! yes yes ! i WILL have top bar hives for natural comb ! I WILL I WILL I WILL ! i INSIST ! long thin single level low leven rectangular boxes with just top strip of indented wood not full frames so bees will build natural comb downwards themselves without wires and very little disturbance to the colony when taking top off and taking out teh honey frames. the BEES will decide how they do eggs comb and bee bread etc frames. these pics of THE MORNING AFTER show that the PAIN is NIL compared to THE MORNING AFTER FROM A HANG OVER FROM ALCOHOL EXCESS that so many suffer from after a Saturday Night out on the Tiles in Chester Town Center etc ! 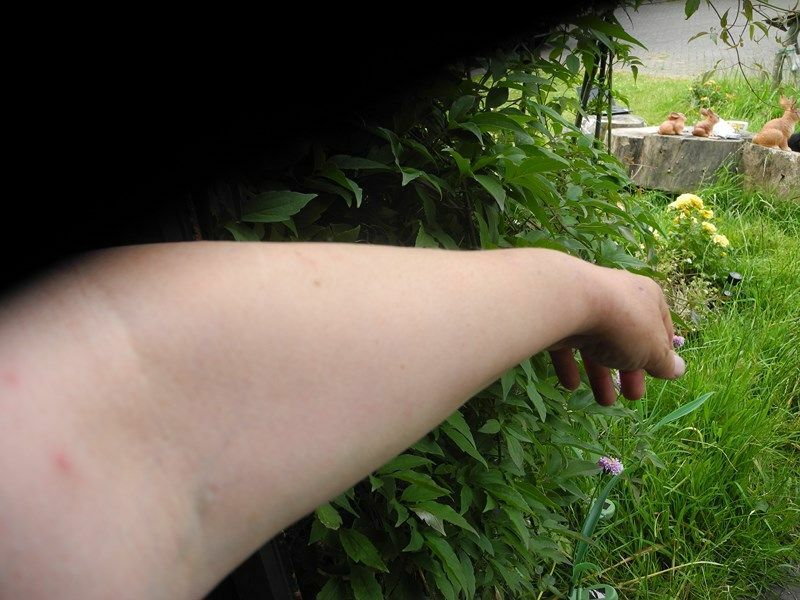 neighbour doc said he is still suffering a bite from a persistant HORSE FLY yesterday as i gleefully pointed out all the bumble bees right in front of our front doors back in full swing...after our blood they are ! 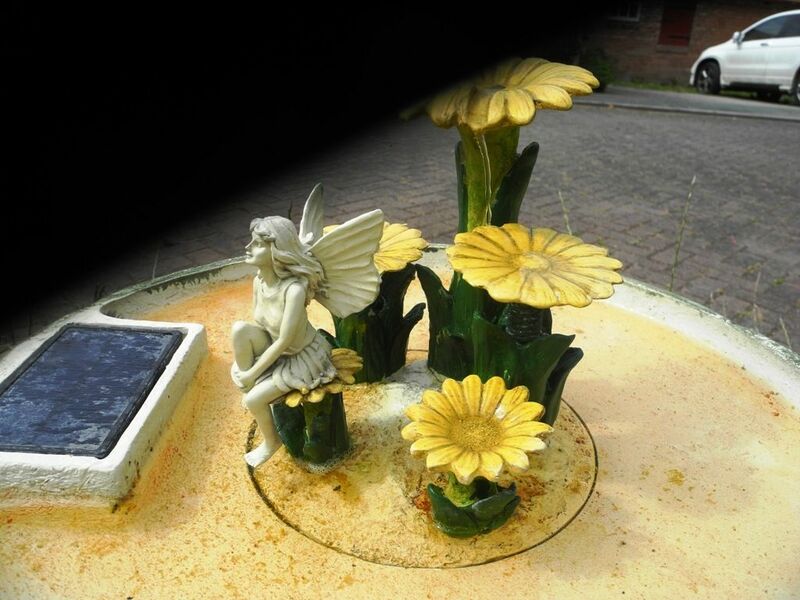 and the solar fountain is working again since 10am 5th july the morning after the fairy also had a bit of a binge last night to celebrate LIFE LIBERTY AND THE PURSUIT OF HAPPINESS FOR ALL ! especially the bees ! let me BUMBLE ALONG SOME MORE ! WITH YOU LOT TOO I HOPE ! ps slight correction, it is FAUSTUS, i misspellt the German Author of Dr Faustus, the great story of a man who agreed to sell his soul to the devil in return for all the pleasures of life possible. Of course this included getting Gretchen pregnant...so was a tragedy. English author Marlowe also wrote a Faust story. Same story. On Walpurgisnacht, the night of Witches, strange things happen. Tonight was the Night of the Blackies. after installing the last mini colony of blackies nto a Dadant hive, I returned the day after to finish the snug adjustments for them, having left all pieces of the shoebox design national hive strewn around ...as a nieghbour nurse said to me in passings hearing of all this hassle over transfering bees...why not just pop the minu hive inside that huge hive and let the bees go find the new frames ? good poiint I thought ! if one ddnt have to return these scheissable national hive nucs and hives ! never again ! the bees seem happy and beavering...busy beeing ! Did you forget to light the smoker? THEY CAME IN FROM THE WILD ! a swarm of blackies ! and they are next to EVE bees as they are the ORIGINAL WELSH BEES that managed to survive varoe, the uk weather etc etc withotu sugar feeds until humans put them into hives of human stupid designs ! 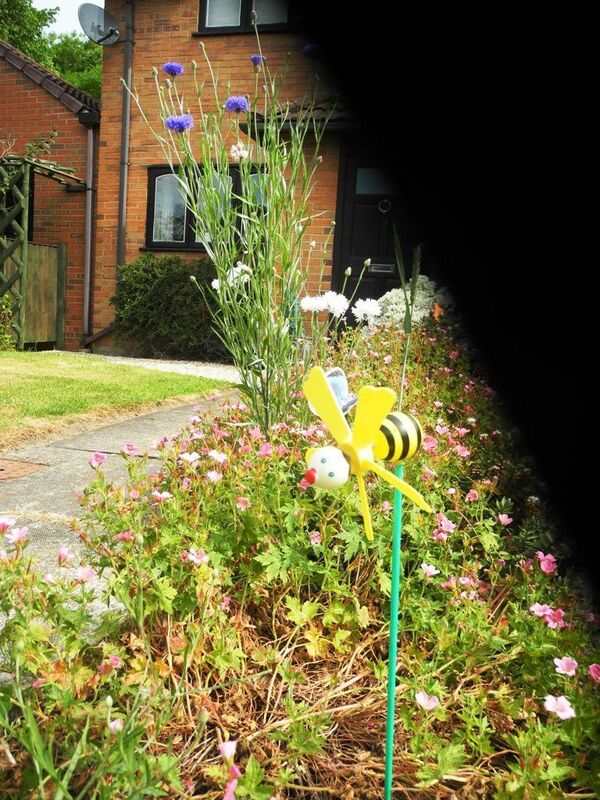 Welsh Black Bees in Cheshire Pulford drinking from Mold Flintshire Garden Shop on high street Solar Fairy Fountain. Apis Mellifera Mellifera. THE ONES WHO GOT AWAY ! from Wales ! They Came in From the Wild ! THEY CAME IN FROM THE WILD ! a swarm of blackies ! and they are called my EVE bees as they are the ORIGINAL WELSH BEES that managed to survive varoe, the uk weather etc etc withotu sugar feeds until humans put them into hives of human stupid designs ! We had a discussion about wing morphology about five pages back on this thread....apparently wing morphology is not a good indicator of sub species type. If this is so those who use wing morph to test their bees are testing for certain types of wing veins and not whether a bee is A.m.m. or not. I have used wing morph and was surprised.... but we live and learn. Phil any updates on your Black Bee Project please? Apologies for lack of posting lately. I have had an 'interesting' summer, which just about exhausted me and I have been recovering in the gaps between teaching and working with bees. Queen rearing has proved more problematic than I anticipated, at least partly due to a rather patchy summer. 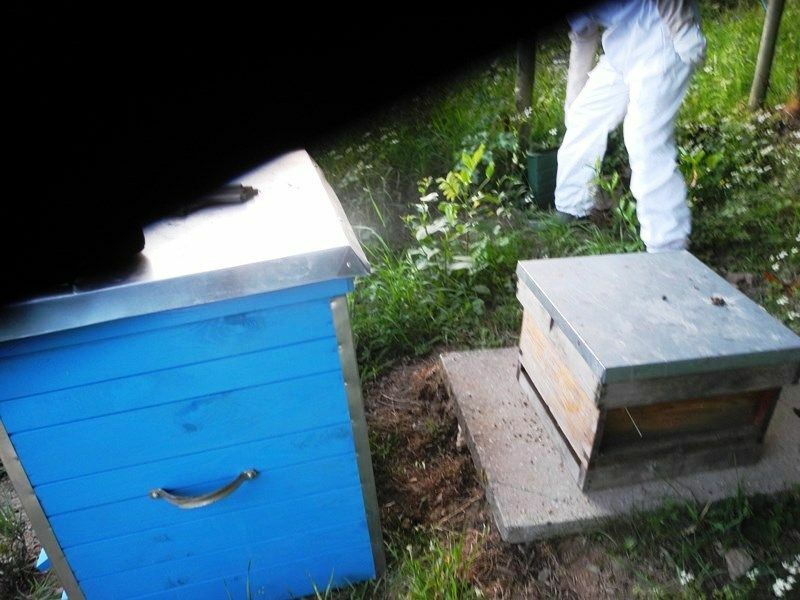 Despite this, we have managed to establish two apiaries with a total of 10 colonies, which will form the basis for our breeding programme next season. We have a number of potential locations for hives in our chosen areas and with a fair wind and decent amount of sun, we should be able to expand considerably next year. I also succeeded in securing some grant money for hardware and essential expenses, which means that I no longer have to fund this project from my own meagre resources. I would like to add AMM queens from Scotland, Ireland and Wales into the mix to improve diversity, and will be keen to hear from anyone who has sources I may not know about.